The Weedy Seadragon is only found in the temperate waters of southern Australia. They are related to seahorses. 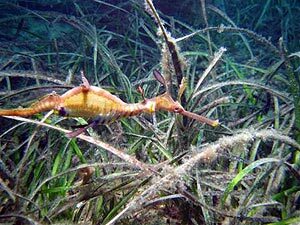 The Weedy Seadragon has a long pipe-like snout with a small terminal mouth. They feed on tiny shrimp called mysids and other small crustaceans. Weedy Seadragons can grow to 46 cm in length. If you’re lucky you can find this camouflaged fish living amongst seaweeds in depths from 3 to 50 metres. They are named for the weed-like projections on their bodies that camouflage them. They feed on tiny crustaceans and other zooplankton, found in crevices,, which are sucked into the end of their long tube-like snout. The male carries the fertilized eggs, attached under his tail, where they are incubated for about eight weeks. The young are independent at birth, beginning to eat shortly after.